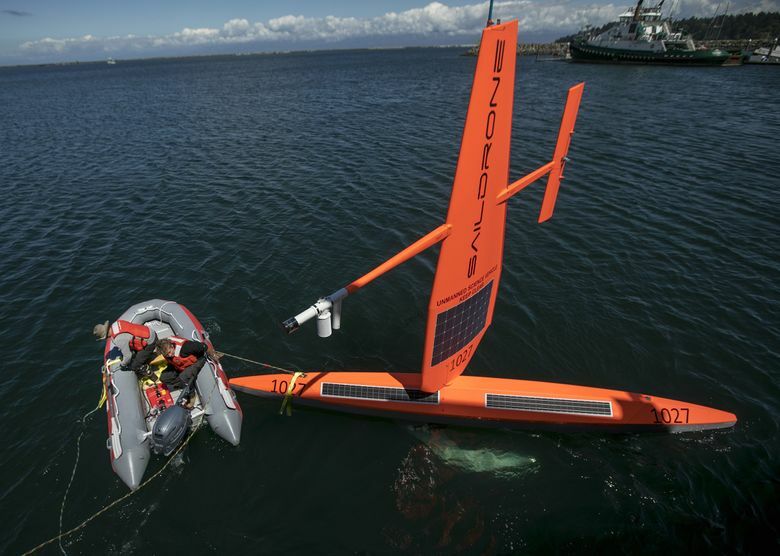 Scientists launched two of the neon-orange, wind-propelled robots off the Washington coast at Neah Bay to survey fish and help improve weather forecasts. NEAH BAY, Clallam County — As the crew of a Makah tribal salmon boat unloaded their catch like generations of fishermen before them, scientists at the other end of the pier in this small coastal community were wrangling more futuristic cargo. Using overhead cranes, the researchers eased two fluorescent-orange craft into the water. 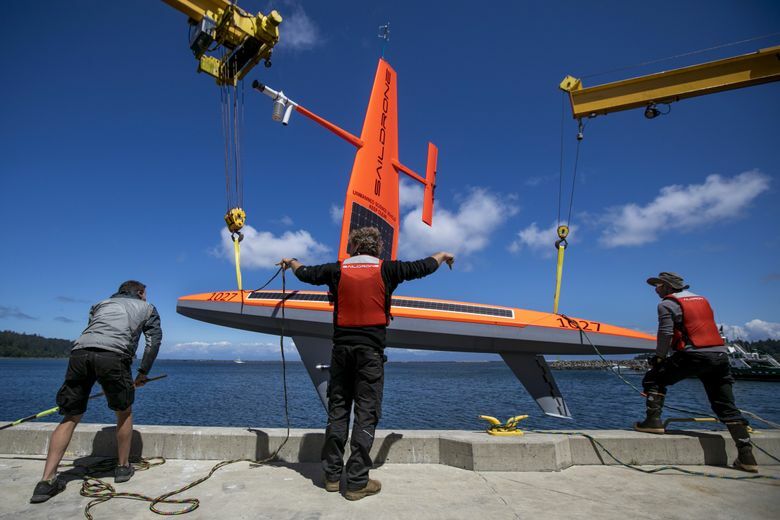 Called saildrones, the unmanned vehicles look like an airplane wing grafted upright onto a surfboard. 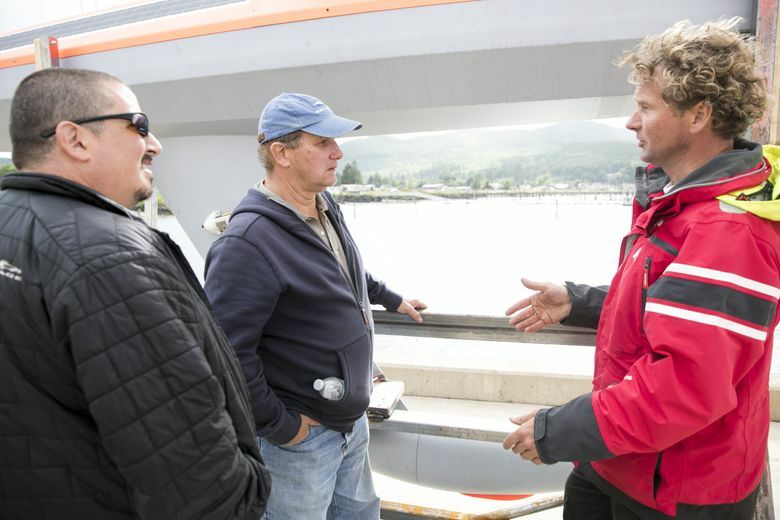 They’re part of a small flotilla that will patrol offshore from Vancouver Island to Southern California for the next three to six months to assess fish populations and gather meteorological data. It’s an experiment to see if the 23-foot robots, propelled by wind and powered by the sun, can perform as well as the costly research ships the National Oceanic and Atmospheric Administration (NOAA) relies on to survey commercially valuable species like hake, sardines and anchovies. Tuesday’s launch marks the first use of saildrones for fisheries science on the West Coast. But previous trial runs in the Arctic and tropics have been so promising that NOAA officials are already dreaming of a future where fleets of autonomous sailing vehicles roam the world’s seas, collecting unprecedented amounts of climate and oceanographic data, tracking endangered species and venturing into places where humans would rather not go. 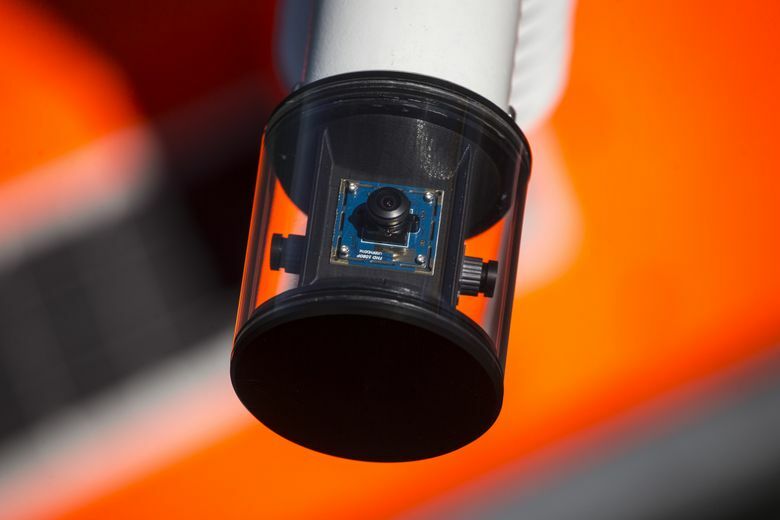 Meinig and his colleagues have been working with Saildrone CEO and co-founder Richard Jenkins for several years to integrate research-quality sensors into the drones so they can measure everything from wave height to salinity, acidity and current speeds. The newest models include the same type of echo-sounding system installed on NOAA ships to detect and count fish. After both drones were in the water, Jenkins instructed them via satellite link to sail back and forth. Satisfied with their performance, he hitched the robots to an inflatable boat and towed them into the open ocean at Washington’s northwestern-most tip. The sailorless sailboats then headed north, following a programmed course to rendezvous with NOAA’s RV Reuben Lasker off Vancouver Island. The drones, which travel about 5 mph and weigh about 1,200 pounds, will trail the faster-moving ship, covering the same transects and collecting the same data for comparison. Later this summer, the research team will launch three additional saildrones from the company’s headquarters in Alameda, California. Two will work their way north, while the third explores shallow bays where big ships can’t venture. 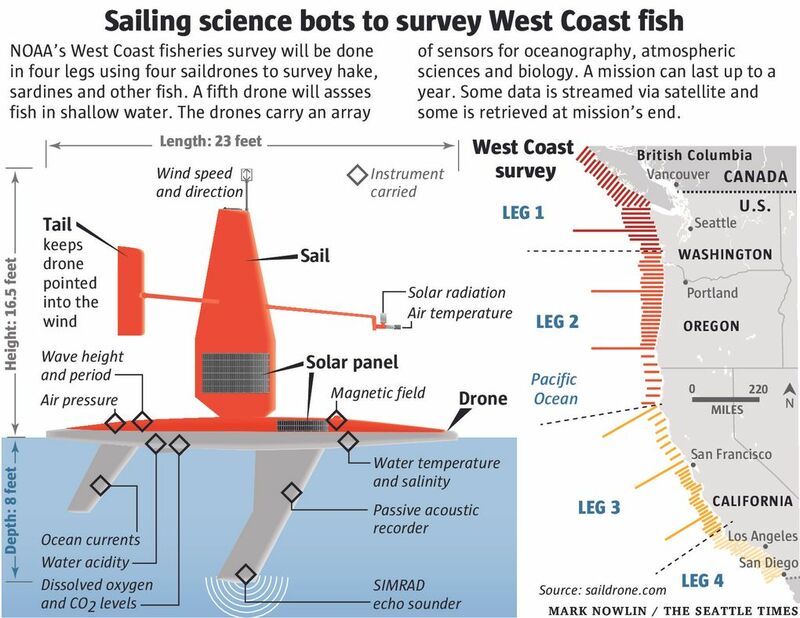 One of the main goals is to see if the drones can improve the population estimates that determine fishing seasons for species like Pacific hake — one of the biggest commercial harvests on the West Coast. In 2016, ships in Washington and Oregon landed 558 million pounds of the mild, white fish — often used to produce imitation crab — at a value of nearly $50 million. NOAA counts hake every other year, with research vessels that cost hundreds of millions of dollars to build and hundreds of thousands of dollars a day to operate. But the area the ships can cover is limited, said Larry Hufnagle, of NOAA’s Northwest Fisheries Science Center in Seattle. NOAA can lease a saildrone for $2,500 a day, which includes support staff to help plan the mission, program the route, track the vehicles and process data. The drones can’t net fish to verify the species, like ships do. But they could act as scouts to locate the schools and fan out to survey a wider area. The drones’ unique design grew out of Jenkins’ 10-year quest to break the speed record for land-sailing. He built several boats on wheels, powered not by a fabric sail but a wing made from carbon fiber that pivots to catch the wind. A counterweight and a small tail stabilize the wing and keep it oriented correctly. The work paid off in 2009. Jenkins shattered the previous record by piloting his land yacht Greenbird to a top speed of 126.1 mph across a dry lake bed in Nevada. Jenkins began tinkering with a waterborne version during a stint building kitesurfing boards for customers like Google co-founder Larry Page. Another Google executive, Eric Schmidt, and his wife, Wendy Schmidt, were the first to bankroll the endeavor with a $2.5 million grant. 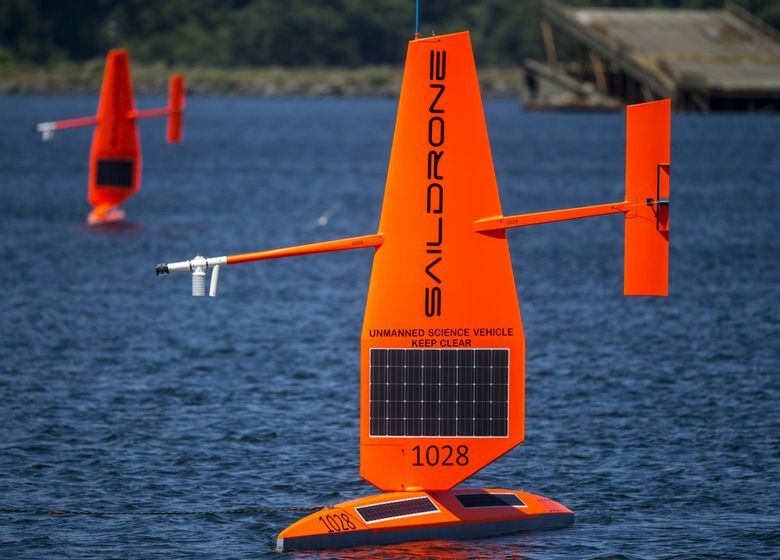 Saildrone has since pulled in $90 million in venture capital from investors banking on the value of detailed ocean and climate date for agriculture, shipping, oil exploration, insurance markets and other commercial enterprises. 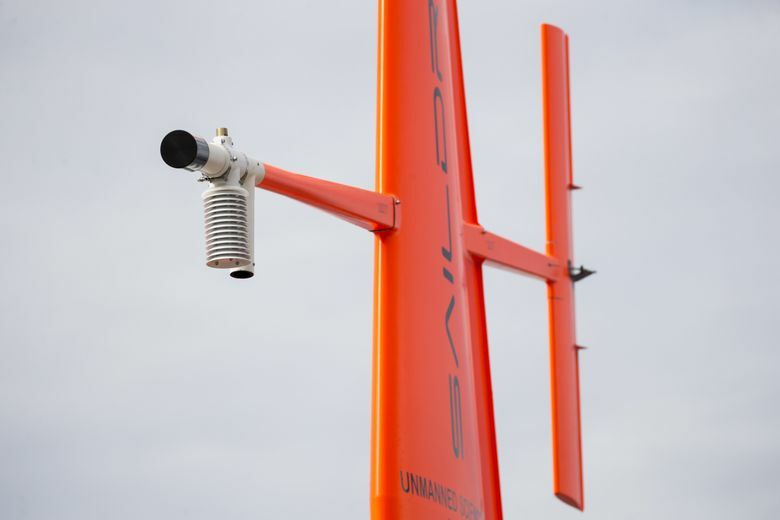 Meinig recognized the drones’ scientific potential immediately and helped negotiate a five-year agreement between NOAA and the fledgling company. 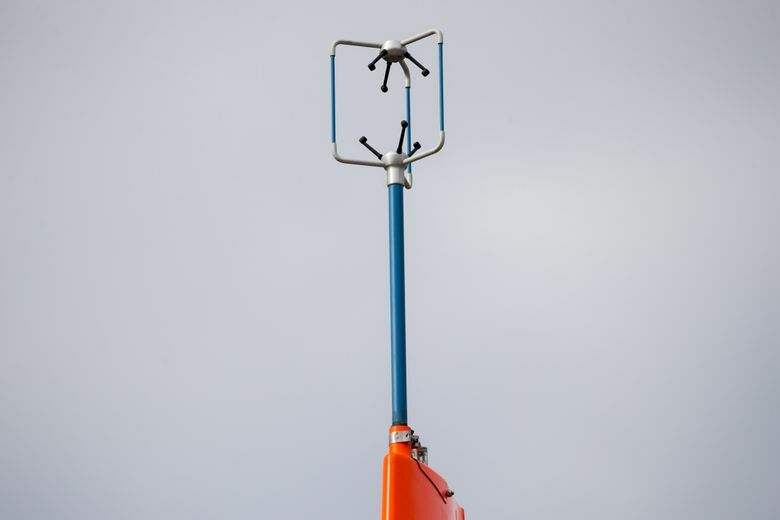 Decades earlier he and his team pioneered the use of autonomous buoys to detect water-temperature changes in the tropics that signal budding El Niño or La Niña patterns. But the buoys are widely spaced and seasonal forecasts suffer as a result. “It’s still just a guess,” Meinig said. Two saildrones that recently returned from an eight-month mission to the tropics provided at least a partial explanation for the forecasts’ shortcomings. The onboard instruments measured sharp temperature gradients over short distances that neither buoys nor satellites can discern, hinting at more complex dynamics and weather impacts than scientists had thought possible. During that trip, the drones rode out a storm that produced the largest wave ever documented in the southern hemisphere, a 78-foot monster measured by a buoy off New Zealand. They also performed well on previous missions in the rough waters of the Bering Sea, where they counted pollock and tracked radio-tagged fur seals. The company hasn’t lost a drone yet, said spokeswoman Nora Cohen. Nor have any of the vehicles become bogged down by bird guano or barnacles, or been struck by ships. The biggest surprise was a hitchhiking seal in the Arctic, who rode one of the drones for two days. The drones can be directed to change course via satellite. They can also be deployed more spontaneously than research vessels, which are scheduled years in advance. That means drones could be the first scientific observers on the scene for dramatic ecological events, like this year’s record low ice cover in the Arctic or a future toxic algae bloom off the coast of Washington, Meinig said. Saildrone is gearing up to meet that demand. The company has produced about 40 of the devices, but soon plans to be cranking out one a day, Cohen said. Their goal is a fleet of a thousand within a few years.